I’ve been wanting to make vegetable beef soup for a while now. I think this will be a husband pleaser, thanks to the stew meat that I’m putting into it! Feel free to substitute that stew meat for a pound or two of browned hamburger. I will update with pictures and opinions at the end of the week after I’ve had a chance to eat it! Place all items besides potatoes in a freezer safe bag (water and v-8 juice optional). Label and Freeze. On day of cooking: Peel and Dice 3 medium potatoes into 3/4” cubes. Place meat and veggie mixture in slow cooker. Pour V-8 juice and 3 cups of water over it (if not originally in bag). Cook on low for 8-9 hours or on high for 4-5 hours. Steps: Slice onion carrots and Celery. Mix spices and all ingredients except potato into a freezer safe bag. Label and Freeze. 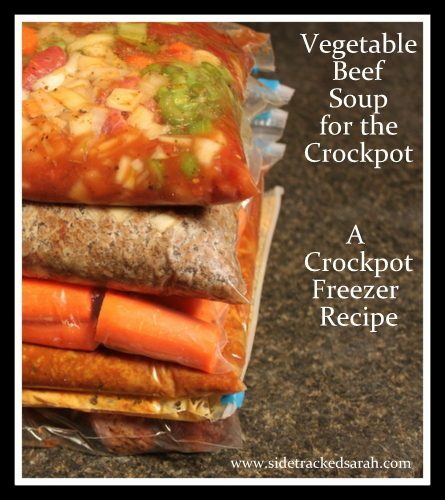 For more slow cooker recipes, be sure to visit my Freezer to Slow Cooker page! Do we cook the beef stew meat first? No, it cooks with the stew.